Enterprises are challenged with moving from legacy architectures to modern architectures in highly virtualized environments. Veritas combines industry leading NBU 8.1 data protection with Nutanix Enterprise Cloud OS to deliver an integrated hyperconverged (HCI) solution that has been tested and proven for both on-premise and enterprise cloud environments. 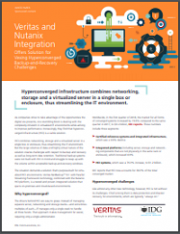 Read this paper to learn more about the Veritas and Nutanix HCI solution.